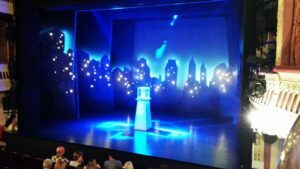 Specifically ‘The Comedy about a Bank Robbery‘ by Mischief Theatre at the Criterion Theatre, London. Mischief is the team behind the Olivier award-winning comedy ‘The Play that Goes Wrong‘ which has been enjoying a protracted run at the Duchess Theatre and ‘Peter Pan Goes Wrong‘ reprising its run at the Apollo, later this year. 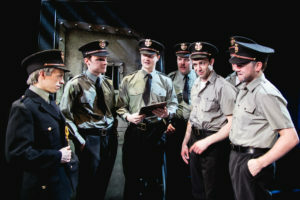 ‘The Comedy about a Bank Robbery‘ is their latest offering, which has met with universal praise. I went to see it last weekend. The Criterion was pretty-much full and the atmosphere as we took our seats was buzzing with anticipation. There was a soundtrack of 1950s popular tunes playing – from Bill Haley to The Four Seasons – which formed an aural backdrop, interspersed with announcements from a Minneapolis radio station of the same vintage. The programme continued the theme, with ‘newspaper’ articles about the rising crime wave in Minneapolis, the arrival in the city of the Crown Prince of Hungary with his fabled diamond and excerpts from a convict’s prison diary. It was in prison that the play began, with a clever inversion of the usual ‘prison break-out’ and some wonderful, if venerable, word play. We then travelled, with the escapee and confederate, to the Twin Cities where we meet a variety of stock characters, most of them crooks. Subtle characterisation doesn’t feature, but the action proceeds at a swift, almost relentless, pace. Part of Mischief’s stock-in-trade is the quick-fire, often physical, gag and of these there is no shortage. If you blink, or your attention wanders, you’ll miss something. The scene is set at a poorly run bank, complete with fraudulent manager and lots of jokes about the moral turpitude of bankers and banking. There is a young femme fatale and a rather older one, mother of a small-time crook who gets caught up in the heist. There are more twists in this plot than in an extremely twisty thing and tongues are firmly in cheeks as we have mistaken identities ( one character has three, which he owns up to ), much fun with a pull-down bed and lots of rapid exits and entrances from doors and windows ( even, supposedly, on the twenty-second floor ). There is a long-running gag about a plague of seagulls – this in the theatre which recently housed the Hitchcock homage ‘The 39 Steps‘ with frequent references to his other films, ‘The Birds’ included. The physical comedy is first-rate and inventive. At one point you ask yourself, do they do it with mirrors? No they don’t, you realise, it’s for real – wow! But then they play the physical situation which they have created for laughs and then.. they explode it altogether. This is clever stuff. The Mischief writing team, of Henry Shields, Jonathan Sayer and Henry Lewis, has another hit on its hands. Did I enjoy it? Yes, it’s too skilled not to, though it was all a bit shouty for me. Farce is always frenetic, but the laughs come more readily if there is more variation in tone and decibel-level than was on display here last weekend. ‘One Man, Two Guv’nors‘ this isn’t, but it’s still funny. Would it be my first choice? 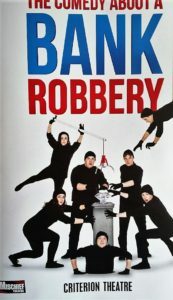 No, there are other plays on at the moment which I prefer – ‘The Comedy about a Bank Robbery‘ is never going to challenge your preconceptions or make you think. But, if you want a good time, to be entertained and laugh at some highly skilled, accomplished theatre, then this is for you. ‘The Comedy about a Bank Robbery‘ at the Criterion Theatre is currently booking until April 2017, ticket prices range from £25 to £75.